During a survey in 2011–2012, three ornamental plants of Araceae namely Aglaonema nitidum, Syngonium podophyllum and Dieffenbachia amoena showing foliar disease symptoms were collected from central region of Iran. Infected plants exhibited spots on their leaves which appeared as yellow and water-soaked with chlorotic haloes and necrotic center. 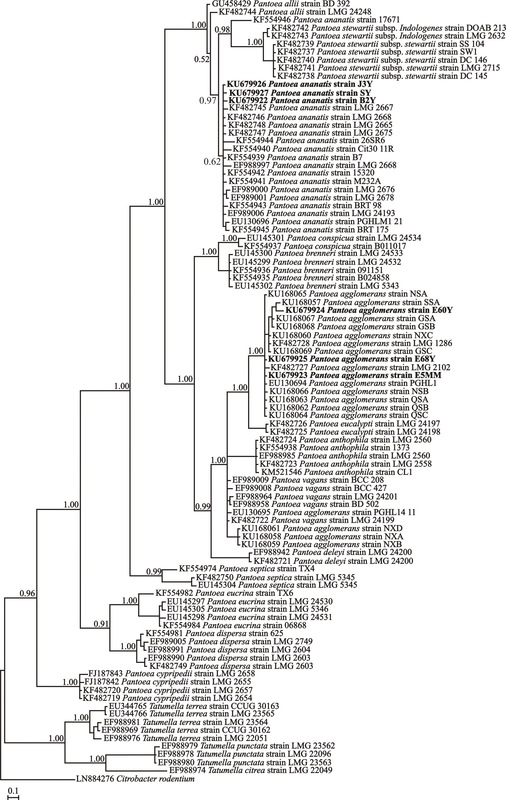 To investigate the etiology of this disorder, symptomatic leaves were collected from affected plants and six bacterial strains (B2Y, J3Y, SY, E60Y, E68Y and E5MM) were isolated and identified as Pantoea ananatis or P. agglomerans based on morphological, physiological, biochemical and molecular characters. The pathogenicity tests of the isolates demonstrated that they were not host specific. 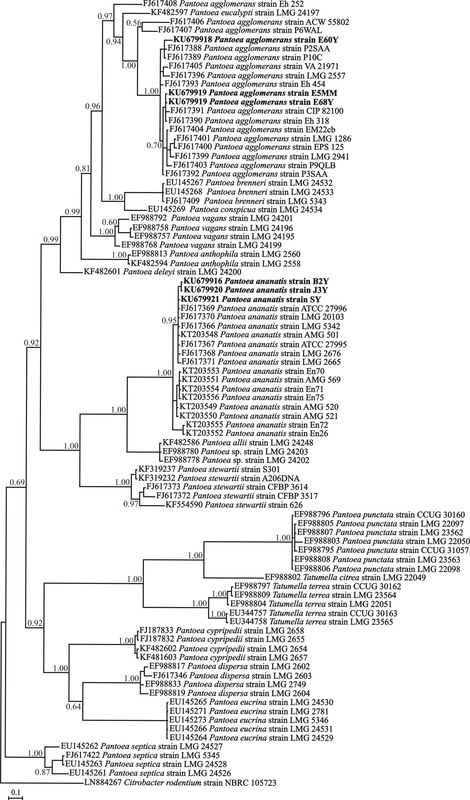 Furthermore, 16S rRNA gene sequencing revealed that the strains were phylogenetically closely related to genus Pantoea. 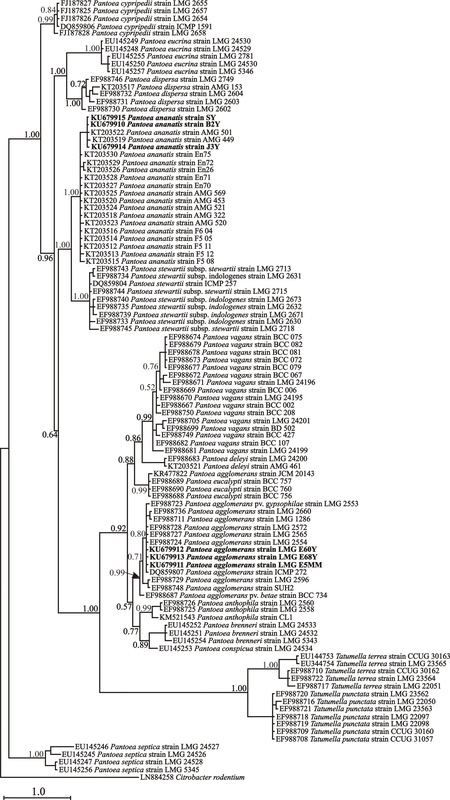 Multilocus sequence analysis (MLSA) of concatenated partial atpD, gyrB and rpoB gene sequences of the six isolates showed a high similarity of B2Y, J3Y, and SY strains to P. ananatis and also of E60Y, E5MM and E68Y strains to P. agglomerans. These results were confirmed by phylogenetic analysis. 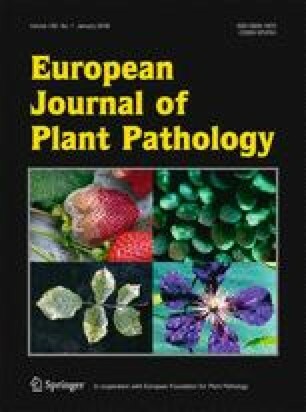 To the best of our knowledge, this is the first report of leaf spot and necrosis of A. nitidum, S. podophyllum and D. amoena caused by the genus Pantoea. The online version of this article (doi: 10.1007/s10658-017-1264-z) contains supplementary material, which is available to authorized users. We gratefully acknowledge financial support from Tarbiat Modares University, Tehran, Iran. Masoud Shams-bakhsh supervised the project, conception and design of study, edited the manuscript. All authors read and approved the final manuscript. The result of this work has not been published previously and is not under consideration elsewhere. This research was funded by Tarbiat Modares University, Tehran, Iran.